When I first started adding monster toys to the list of things I was collecting, I had vowed not to be quite as aggressive about it as I had previously been with jumbos. No, or few, high dollar purchases for me. There were only two items that I had tagged with the label "holy grail". One was the 19" Frankenstein piggy bank that I mentioned in this King Kong review. The other was this Monster Mobile. One down, one to go. I'm not the only one who covets this toy. It's one of the most sought after among monster fans and prices have risen greatly in the last few years. I won't say how much I paid, but I've bought jumbos for less. So what makes it so highly sought after? Well, first off, it's just weird. It's a bunch of monsters riding around in a hot rod. 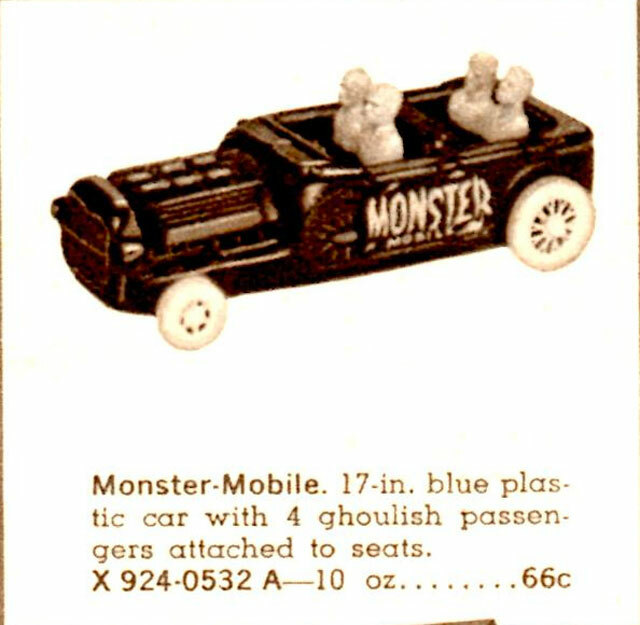 This is a weird sub-genre of collectibles that was popular in the 1960s when this toy was produced, with Aurora producing model kits of the classic monsters in various silly vehicles as well as all the Big Daddy Roth and Weird-Ohs kits that were on the market at the time. There has even been a minor revival of this theme lately with Mattel's "Monster 500" toy line. In addition to being apart of that genre, it's also a big, blow molded toy. Jumbo fans aren't the only ones who like blow molded toys. It's a popular style among monster fans as well. Combine these factors with a demand that far exceeds supply and you've got a hot collectible. The toy is about 17" long and the monsters are separately molded pieces of plastic. There are color variations of both the monsters (sometimes the colors are swapped, or one is orange) as well as the tires, which can also be found in black. Even the main car itself is sometimes black or dark blue. Beware of "custom" ones in other colors, such as light blue. 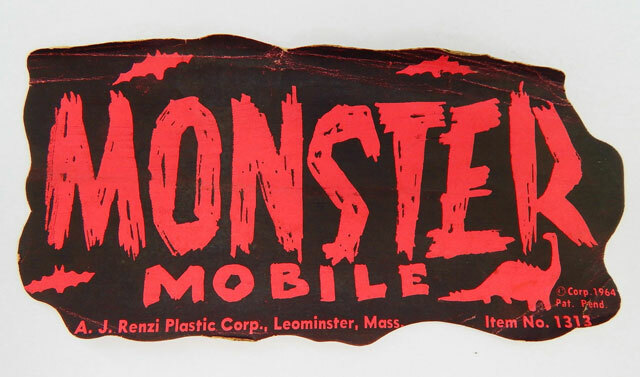 Renzi made other cars that were similar but didn't have monsters and the wheels can be found on other Renzi toys as well, such as a plane. As for the monsters themselves, they are a weird mix. You get Frankenstein and the Wolf Man, but then you also get two weird characters who seems like some bizarre takes on a vampire and a devil. Why this was done is something of a mystery. As cool as this one is, it would be even more desirable if you had a more traditional sampling of monsters like Frankenstein, the Wolf Man, Dracula and the Mummy. And if there were a Creature From the Black Lagoon in there, I'm sure prices for this toy would be astronomical. The rarest thing about this toy is the sticker that originally came attached to the side. It can been seen in an ad but until fairly recently it was rarely, if ever, actually seen in person. The best part about it is that it inexplicably features pictures of dinosaurs on it! Since one first appeared on eBay, it has been reproduced several times so beware of fakes. I don't know what kind of packaging, if any, this toy was released in but a bag with header card seems likely. I'm quite happy to own this toy and it's likely the centerpiece of my monster collection...until I get that Frankenstein.